If you’ve ever watched a disaster movie, listened to that old Aerosmith single or nervously glanced at a maximum load placard, you’ve probably pondered what you would do if you were ever trapped in a falling elevator. Modern elevators incorporate safety features to help prevent fatal falls.Traction elevators, which move cars up and down using steel cables, pulleys and counterweights, have a speed-sensing governor. If the car zips downward too quickly, the governor activates brakes on the elevator’s travel rails. Traction elevators also locate switches along the elevator shaft, which detect cars as they pass and initiate slowdowns and stops at the appropriate points in their travel, whether during a normal stop or because the car is moving too fast. 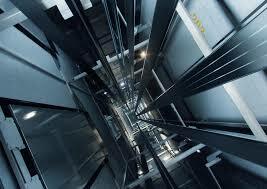 Each of the four to eight steel cables in a traction elevator is strong enough by itself to hold the car. Hydraulic elevators, which lift and lower elevator cars using a piston jack similar to the one auto mechanics use to lift automobiles, generally lack the safety features of traction elevators (unless the builders install special aftermarket safety brakes). Although they are unlikely to fail, if they do, they are more likely to fail catastrophically than traction elevators. On the plus side, it’s impractical to build a hydraulic lift higher than six stories, so you’re only going to fall 60 to 90 feet. Then again, that means you’ll hit the basement doing a brisk 48 to 53 mph. Ouch. So, you’re in a falling elevator. Life has given you proverbial lemons, and you have seconds to make some lemonade or end up as pulp. What to do? Some people advocate jumping upward a split-second prior to impact to reduce your impact speed. Assuming you retain the presence of mind and Olympic reactions to pull this off, however, the best speed reduction you could hope for would be 2 or 3 mph. More likely, you’d hit your head on the ceiling and land badly, exacerbating your injuries. Another suggestion holds that you should stand with your knees bent to absorb the impact, like a skydiver. Theoretically, your legs would flex as you and the elevator touched down, spreading your body’s deceleration over a longer period (impact force is proportional to speed and mass, and inversely proportional to time and stopping distance the longer the time spent stopping, the less the force). The effectiveness of this approach at high speeds, however, remains unclear, and research shows that you would likely be subjecting your knees and legs to greater injury risk at low speeds. This approach also keeps your body parallel to the lines of force, which increases the chance of bone breakage as you crumple to the floor under high load. With these factors in mind, the consensus view holds that your best bet is to lie flat on your back on the floor and cover your face and head to guard against debris. Hitting the ground floor in this position spreads the force of impact across your body; it also orients your spine and long bones perpendicular to the impact direction, which will better protectthem from crushing damage. Your thinner bones, like ribs, might still snap like twigs, but you’re picking your poison here. 1. Making gravy without the lumps: With your body positioned flat on the floor, your soft tissues including your brain and organs absorb the full impact. Considering that even low-speed fender-benders can cause severe damage, it’s easy to imagine the consequences of a sudden stop at 50-plus mph would be dire indeed. 2. The tiger trap: There’s always the possibility that no matter how well you cushion for impact, something else will do you in. For example, the elevator car might be destroyed on impact, transforming the floor into a zone of impaling, lacerating and crushing debris. Betty Lou Oliver, who holds the Guinness World Record for Longest Fall Survived in an Elevator, lived through falling 75 stories (more than 1,000 feet) in an Empire State Building elevator in 1945. Had she been lying on the floor, she probably would have been killed. (In her case, the disconnected elevator cable coiled at the bottom of the shaft softened her landing.) Some elevator shafts feature cushioned buffers designed to soften the landing of an elevator that travels past its bottom floor, but these are not designed to catch free falling cars. 3. Because you’re free free falling: In a falling elevator, you are in free fall relative to the car; in other words, you feel weightless and experience no force pulling you toward the floor. In order to lie down flat, you would have to find some way to pull yourself down and then hold yourself there without bouncing off the floor. Even taking all these factors into account, lying flat on your back, if you can manage it, is still probably your best bet for surviving a falling elevator. Realistically, you’re just trying to survive, and the supine approach gives the best odds. It might also be the statistically best option for reducing injuries over a shorter drop. Of course, it’s extremely unlikely you’ll ever need to find out if this approach works, but in case you do, at least it’s easy to remember. This entry was posted in Home, How to:??. Bookmark the permalink.